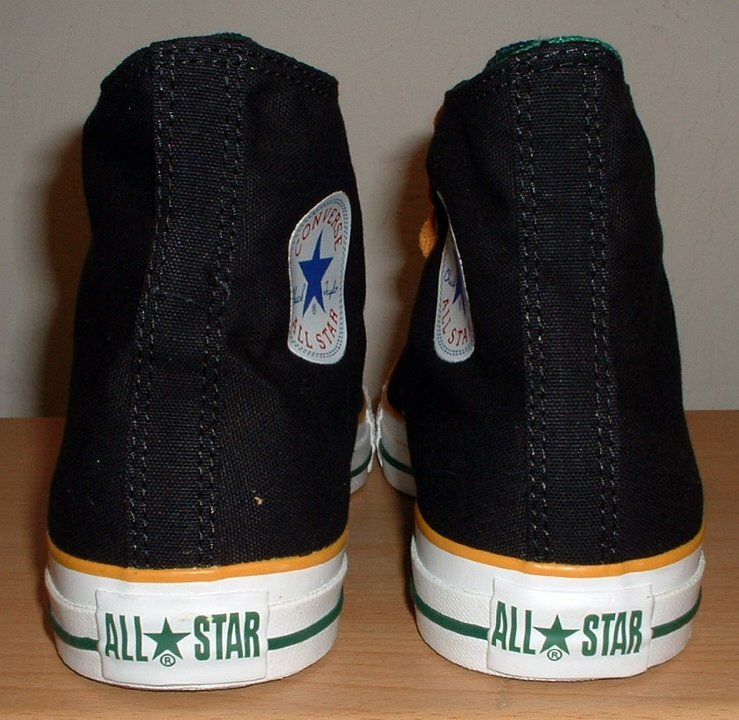 Photo gallery 3 of foldover high top chucks. 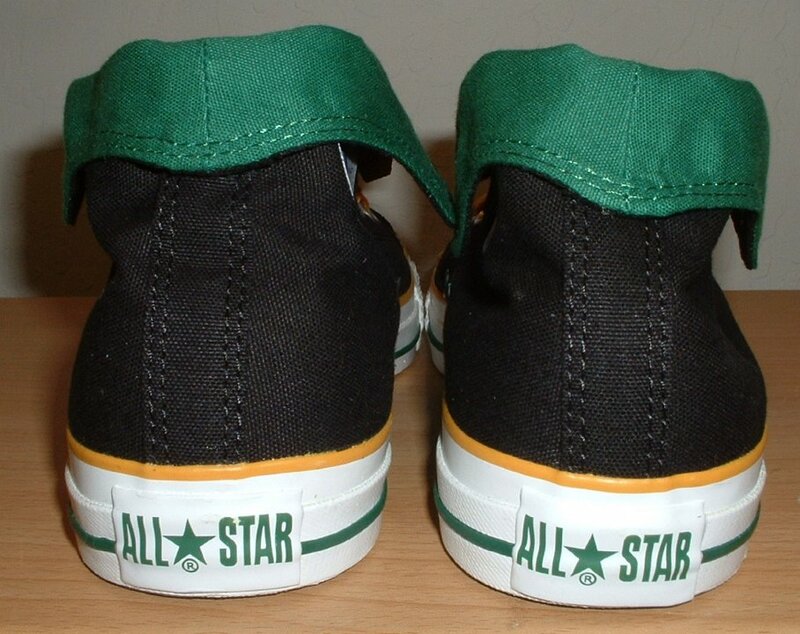 1 Foldover High Top Chucks Black, green, amber foldover, right inside patch view. 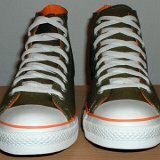 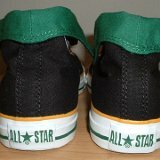 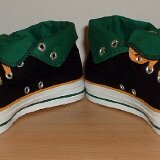 2 Foldover High Top Chucks Black, green, amber foldover, left outside view. 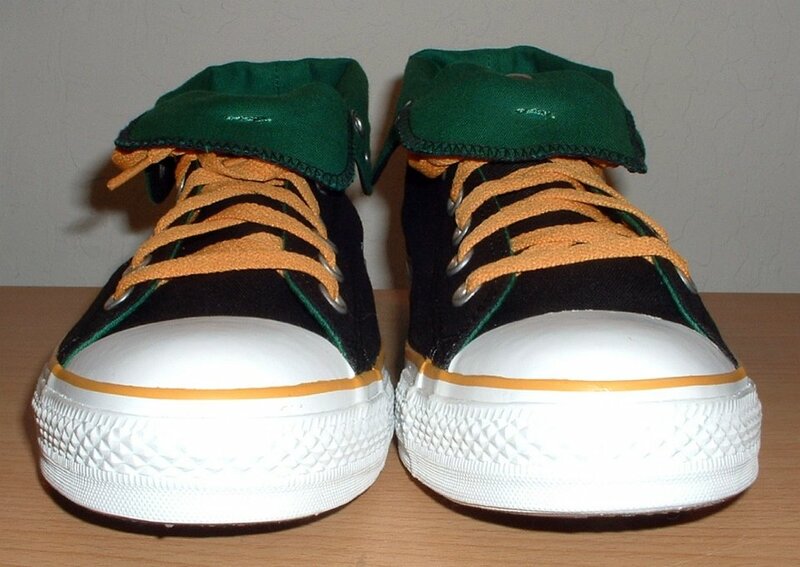 3 Foldover High Top Chucks Black, green, amber foldover, left inside patch view. 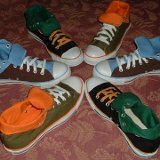 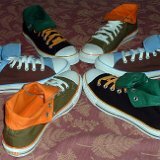 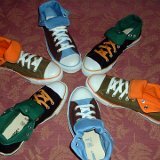 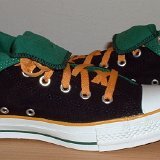 4 Foldover High Top Chucks Black, green, amber foldover, right outside view. 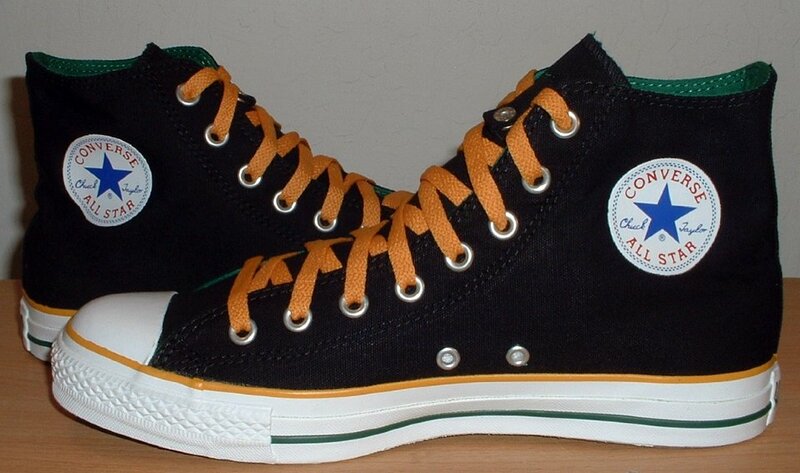 5 Foldover High Top Chucks Black, green, amber foldover, rear view. 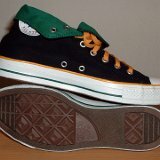 6 Foldover High Top Chucks Black, green, amber foldover, front view. 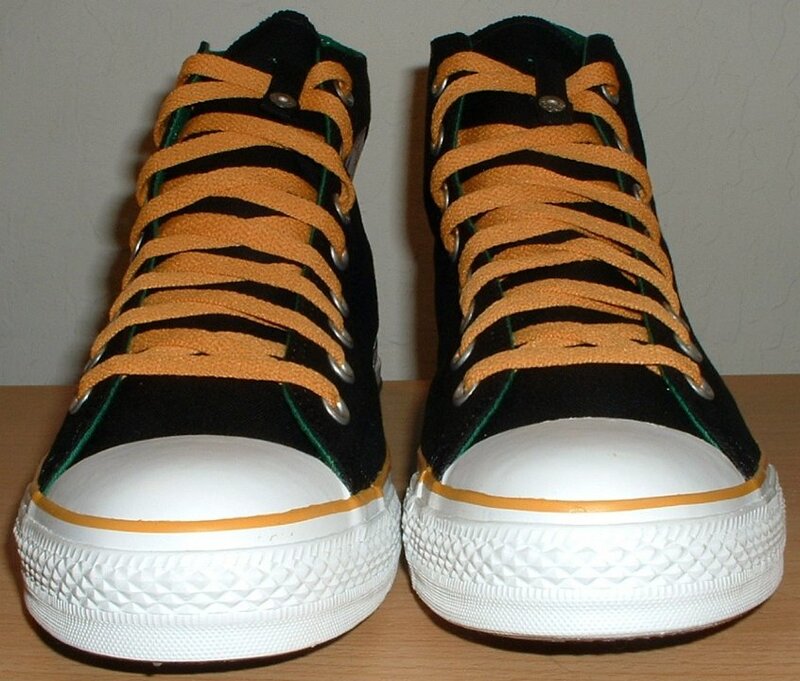 7 Foldover High Top Chucks Black, green, amber foldovers, angled front view. 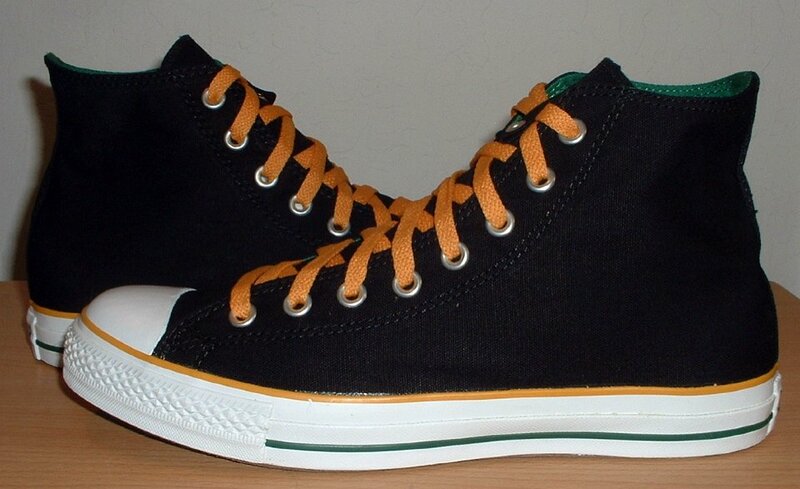 8 Foldover High Top Chucks Black, green, amber foldovers, top view. 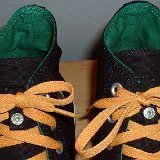 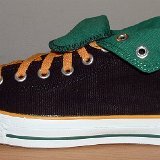 9 Foldover High Top Chucks Black, green, amber foldover, showing close up of lace snap. 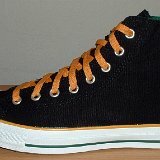 10 Foldover High Top Chucks Black, green, amber foldovers, inside patch views. 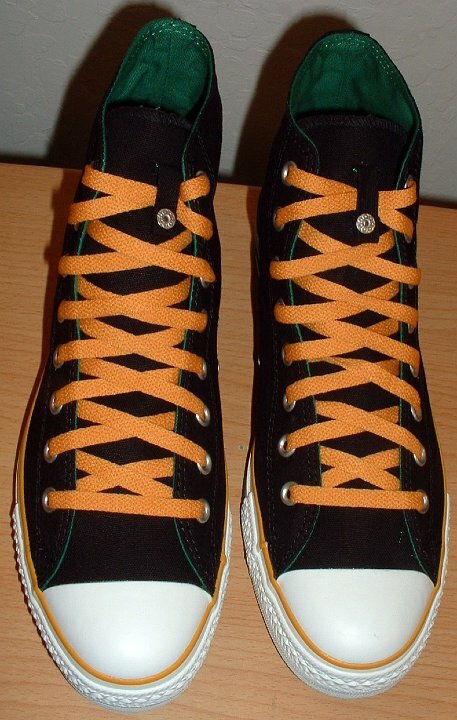 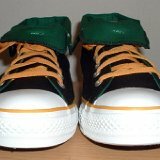 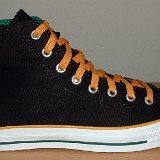 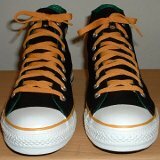 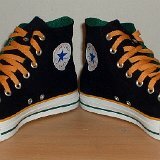 11 Foldover High Top Chucks Black, green, amber foldovers, outside view. 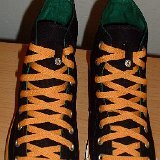 12 Foldover High Top Chucks Front view of laced black, green, amber foldovers, showing one way to use the lacing snaps. 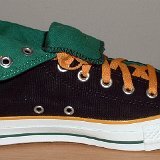 13 Foldover High Top Chucks Closeup of the lace snap with a tied bow on black, green, amber foldovers. 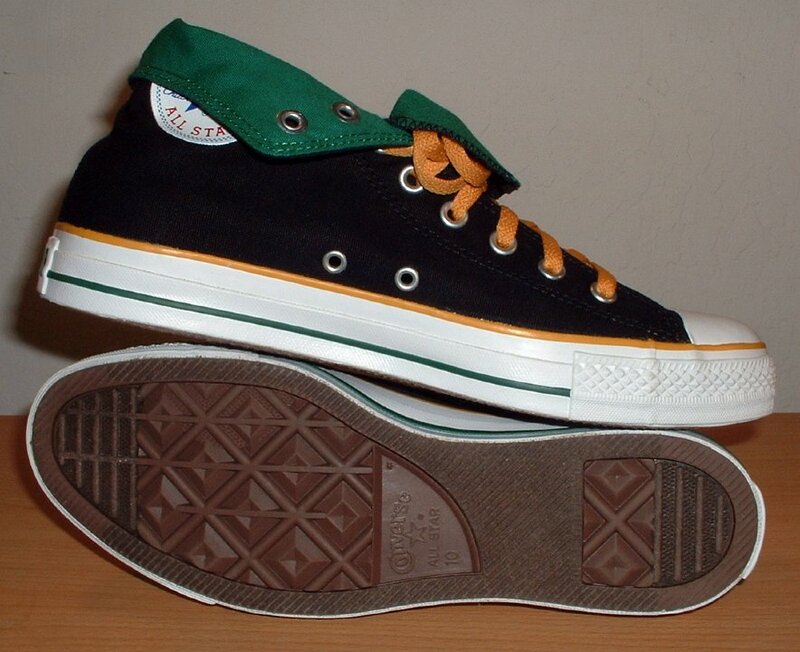 14 Foldover High Top Chucks Outside view of a right black, green, amber foldover rolled down to the sixth eyelet. 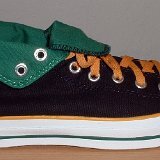 15 Foldover High Top Chucks Inside patch view of a right black, green, amber foldover rolled down to the sixth eyelet. 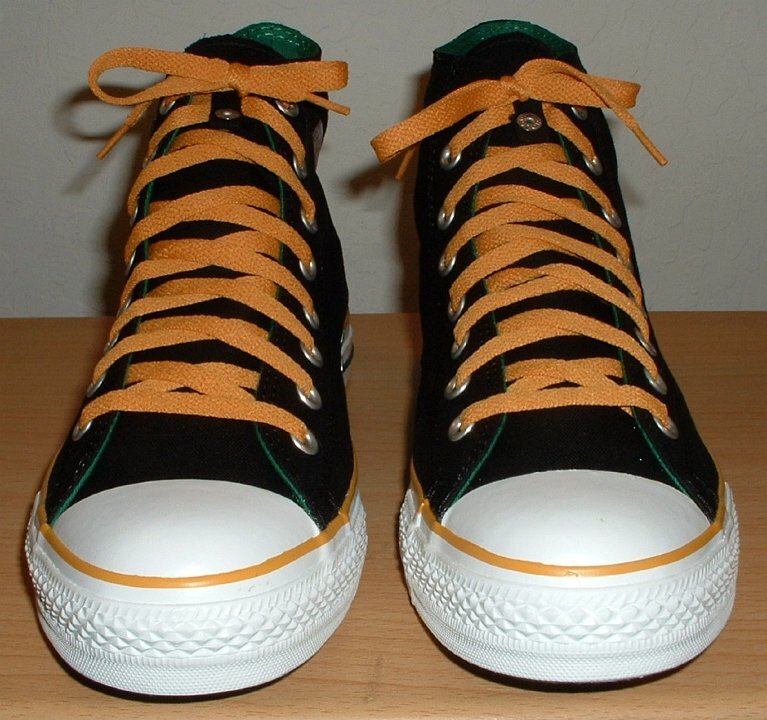 16 Foldover High Top Chucks Outside view of a left black, green, amber foldover rolled down to the sixth eyelet. 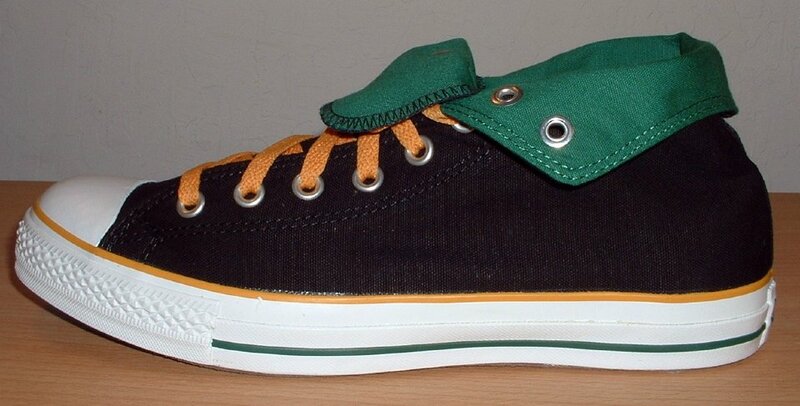 17 Foldover High Top Chucks Inside patch view of a left black, green, amber foldover rolled down to the sixth eyelet. 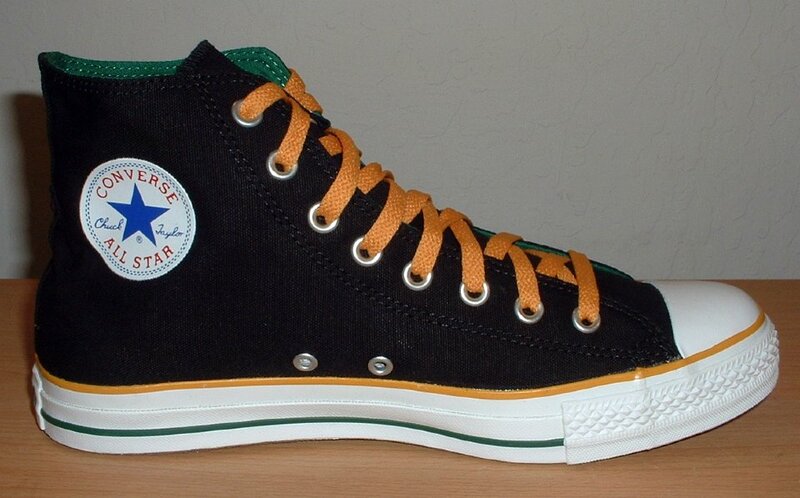 18 Foldover High Top Chucks Rear view of black, green, amber foldovers rolled down to the sixth eyelet. 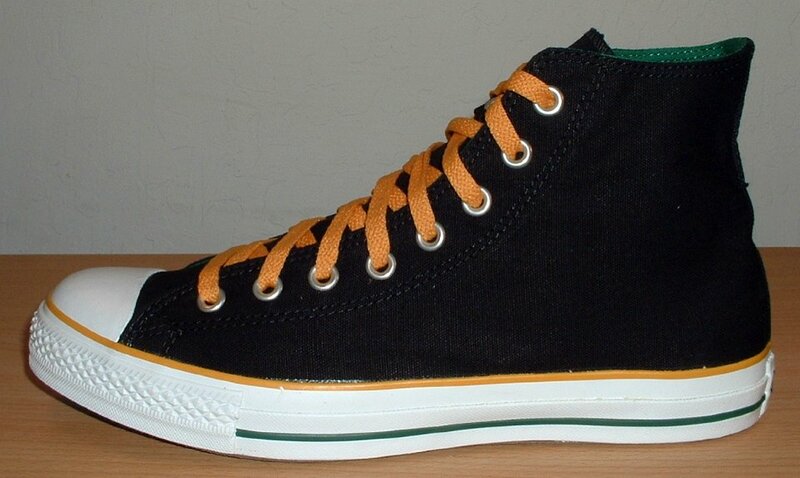 19 Foldover High Top Chucks Front view of black, green, amber foldovers rolled down to the sixth eyelet. 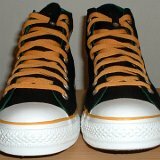 20 Foldover High Top Chucks Angled front view of black, green, amber foldovers rolled down to the sixth eyelet. 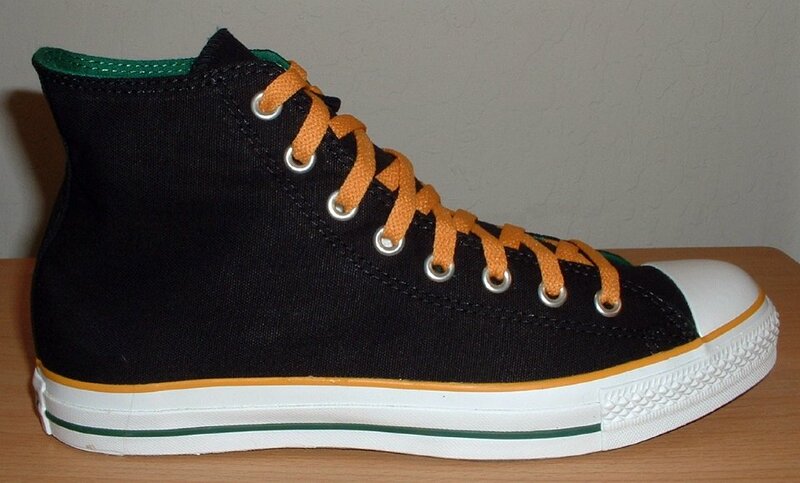 21 Foldover High Top Chucks Top view of black, green, amber foldovers rolled down to the sixth eyelet. 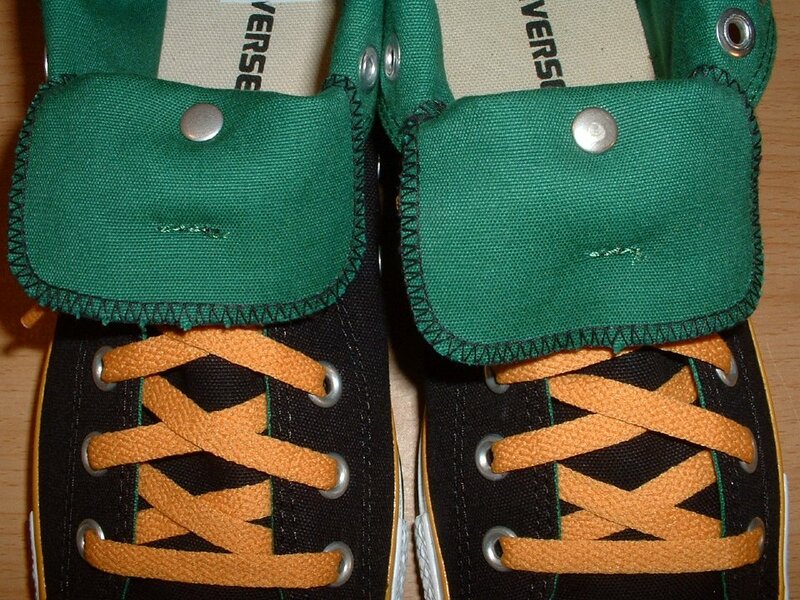 22 Foldover High Top Chucks Closeup view of black, green, amber foldovers rolled down to the sixth eyelet, showing the underside of the snap-on lace holder. 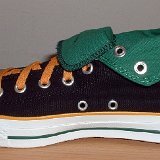 23 Foldover High Top Chucks Inside patch views of black, green, amber foldovers rolled down to the sixth eyelet. 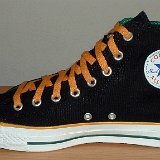 24 Foldover High Top Chucks Inside patch and sole views of black, green, amber foldovers rolled down to the sixth eyelet. 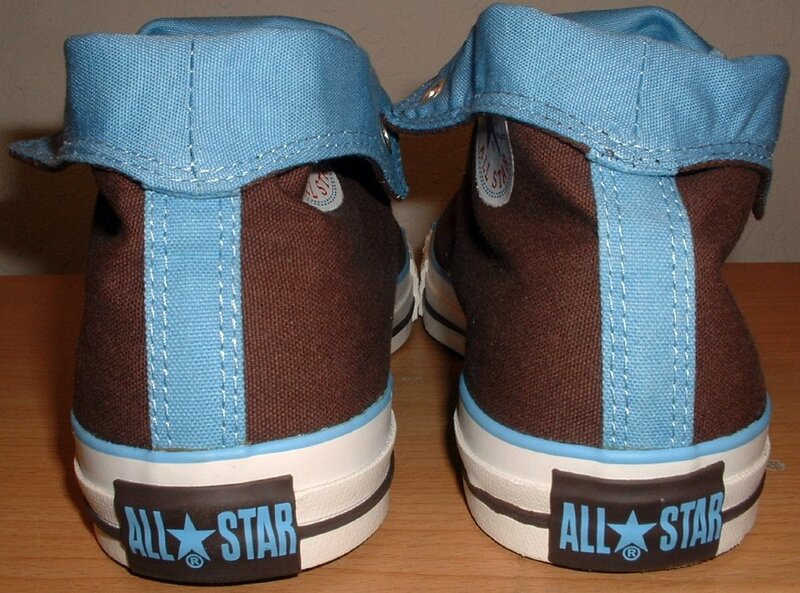 25 Foldover High Top Chucks Inside patch view of a left brown and Carolina blue 2 tone foldover. 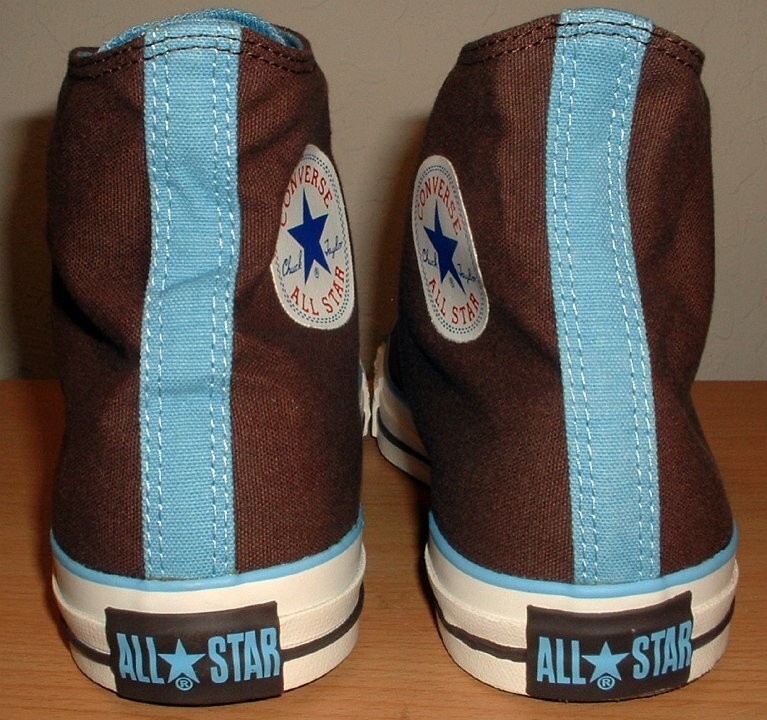 26 Foldover High Top Chucks Inside patch view of a right brown and Carolina blue 2 tone foldover. 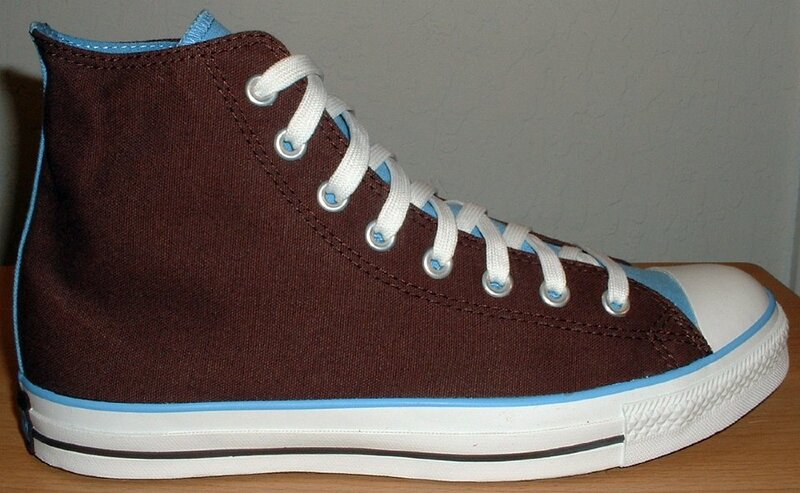 27 Foldover High Top Chucks Outside view of a left brown and Carolina blue 2 tone foldover. 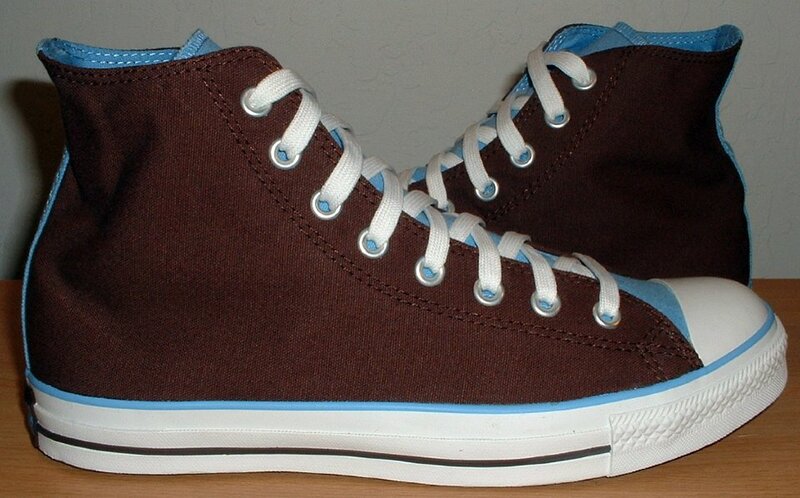 28 Foldover High Top Chucks Outside view of a right brown and Carolina blue 2 tone foldover. 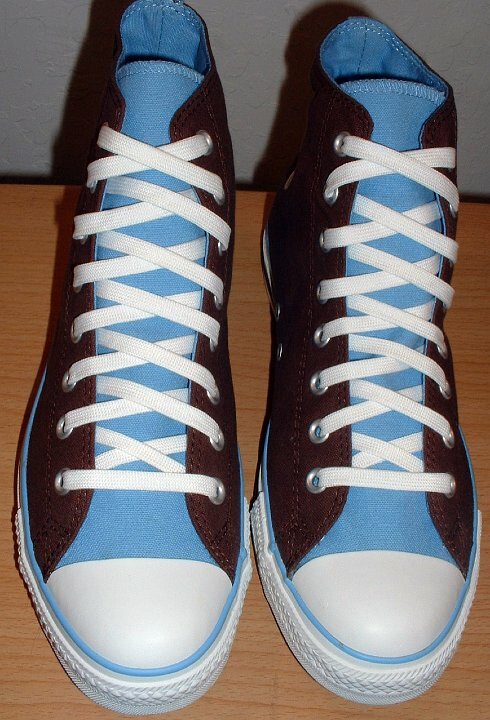 29 Foldover High Top Chucks Front view of brown and Carolina blue 2 tone foldovers. 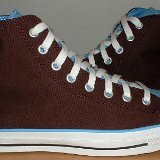 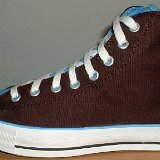 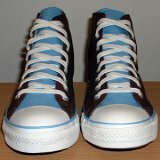 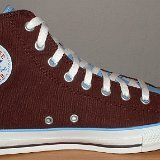 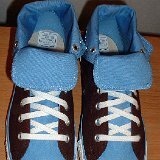 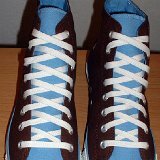 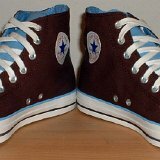 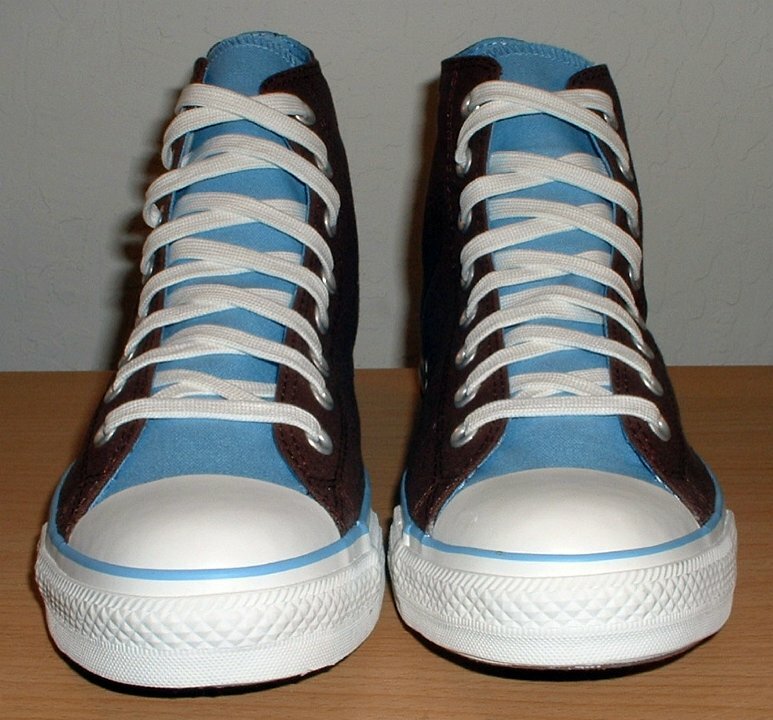 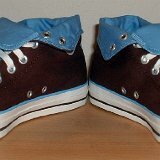 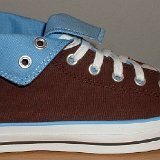 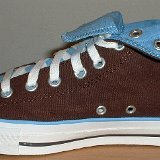 30 Foldover High Top Chucks Top view of brown and Carolina blue 2 tone foldovers. 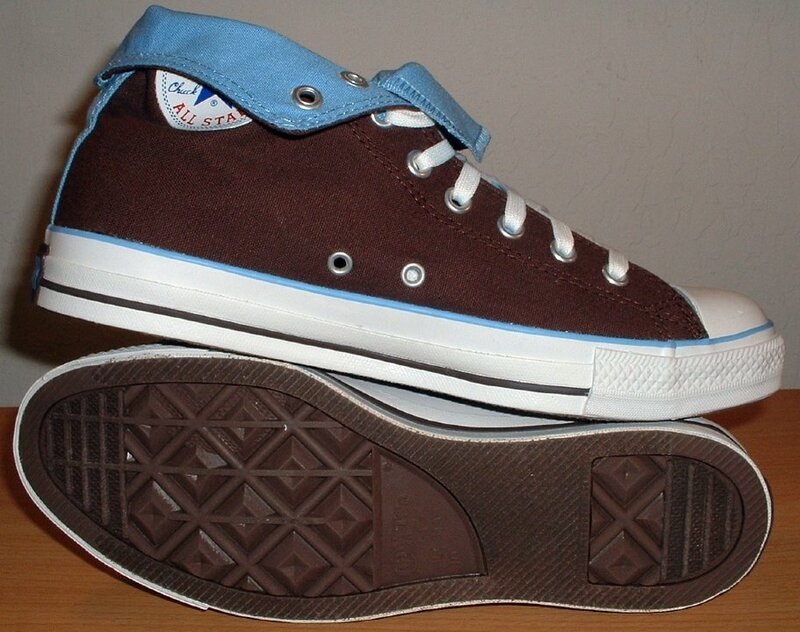 31 Foldover High Top Chucks Rear view of brown and Carolina blue 2 tone foldovers. 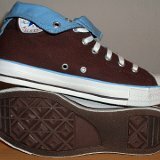 32 Foldover High Top Chucks Angled front view of brown and Carolina blue 2 tone foldovers. 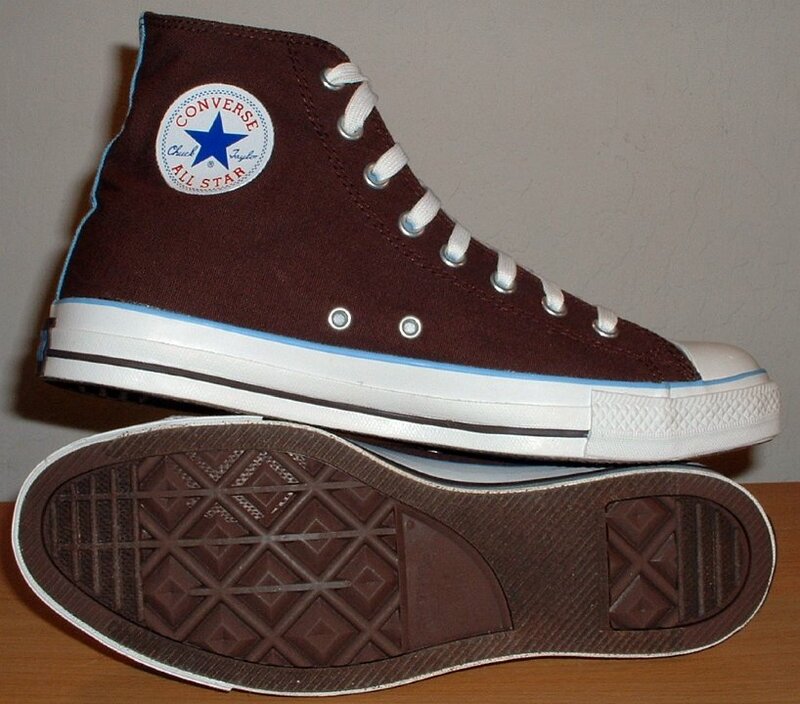 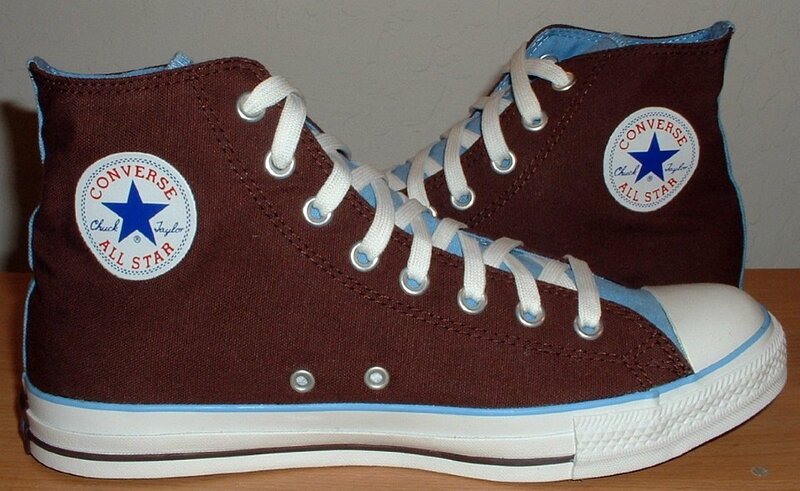 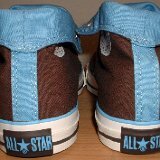 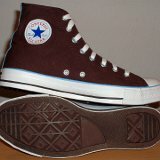 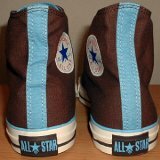 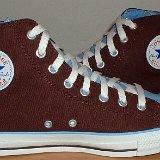 33 Foldover High Top Chucks Inside patch views of brown and Carolina blue 2 tone foldovers. 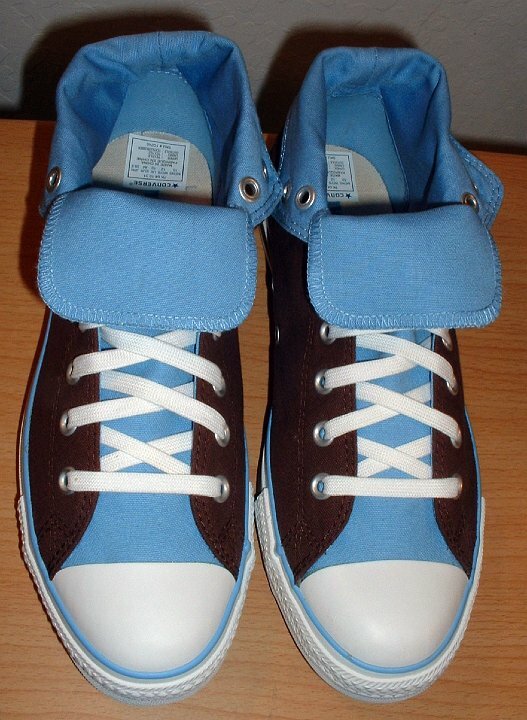 34 Foldover High Top Chucks Outside views of brown and Carolina blue 2 tone foldovers. 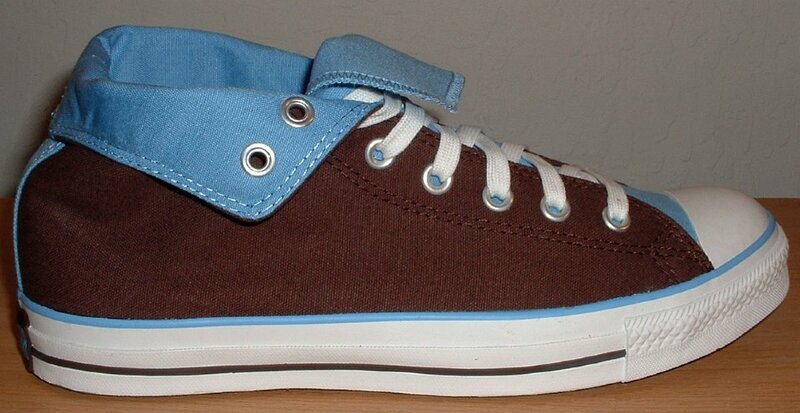 35 Foldover High Top Chucks Sole and inside patch views of brown and Carolina blue 2 tone foldovers. 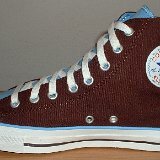 36 Foldover High Top Chucks Inside patch view of a right brown and Carolina blue 2 tone foldover rolled down to the sixth eyelet. 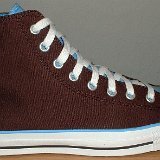 37 Foldover High Top Chucks Outside view of a right brown and Carolina blue 2 tone foldover rolled down to the sixth eyelet. 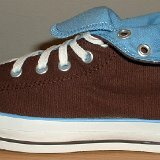 38 Foldover High Top Chucks Outside view of a left brown and Carolina blue 2 tone foldover rolled down to the sixth eyelet. 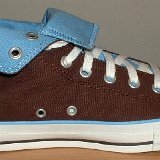 39 Foldover High Top Chucks Inside patch view of a left brown and Carolina blue 2 tone foldover rolled down to the sixth eyelet. 40 Foldover High Top Chucks Rear view of brown and Carolina blue 2 tone foldovers rolled down to the sixth eyelet. 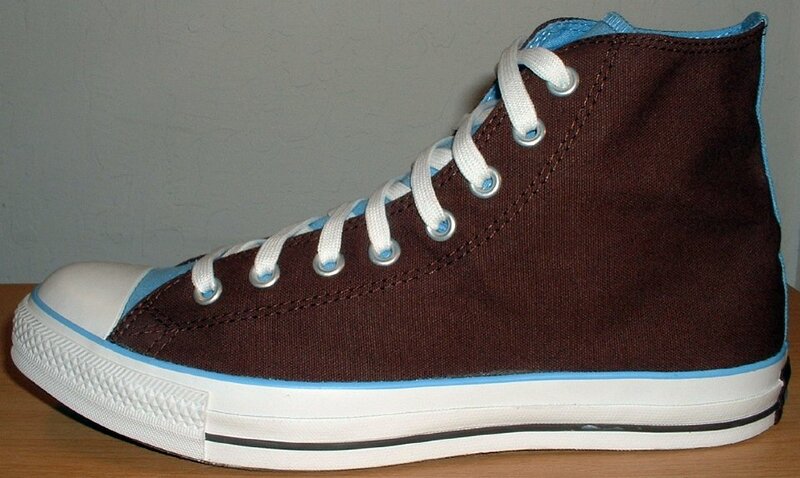 41 Foldover High Top Chucks Front view of brown and Carolina blue 2 tone foldovers rolled down to the sixth eyelet. 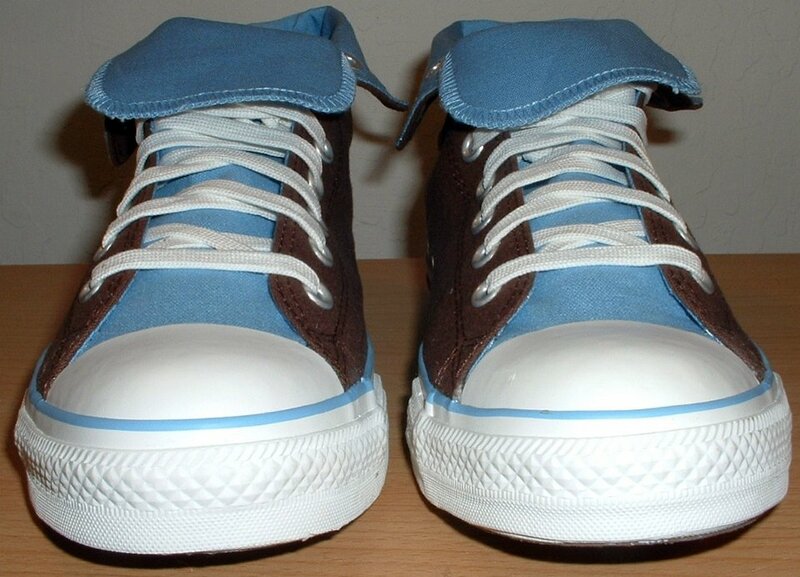 42 Foldover High Top Chucks Angled front view of brown and Carolina blue 2 tone foldovers rolled down to the sixth eyelet. 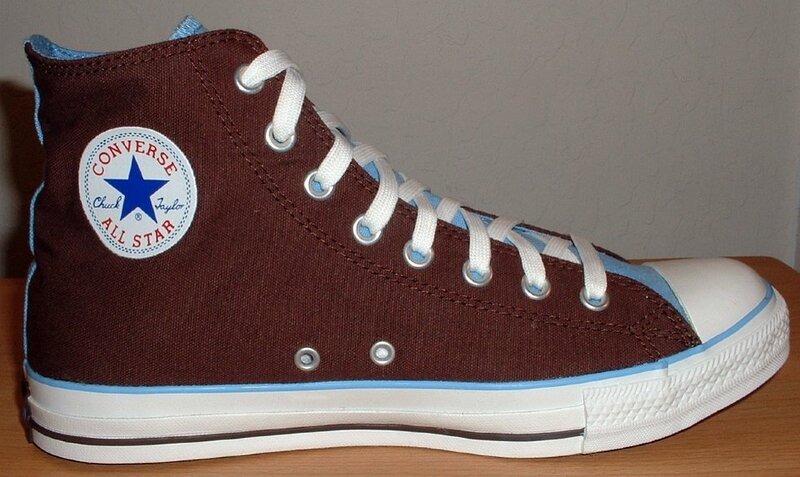 43 Foldover High Top Chucks Top view of brown and Carolina blue 2 tone foldovers rolled down to the sixth eyelet. 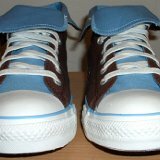 44 Foldover High Top Chucks Sole and inside patch views of brown and Carolina blue 2 tone foldovers rolled down to the sixth eyelet. 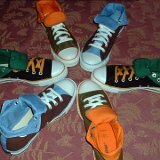 46 Foldover High Top Chucks Wheel of foldover chucks, view 2. 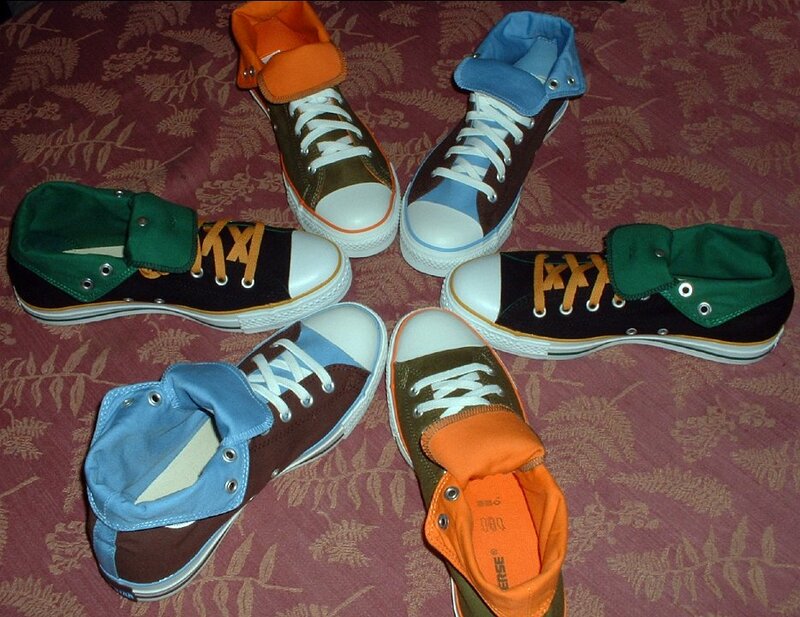 47 Foldover High Top Chucks Wheel of foldover chucks, view 3. 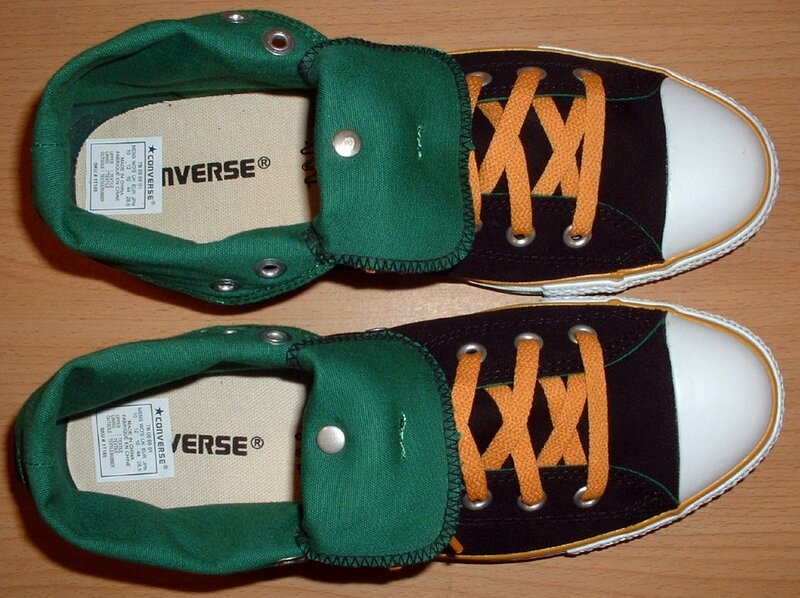 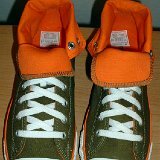 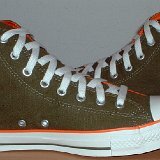 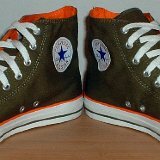 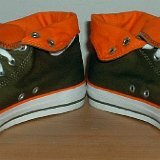 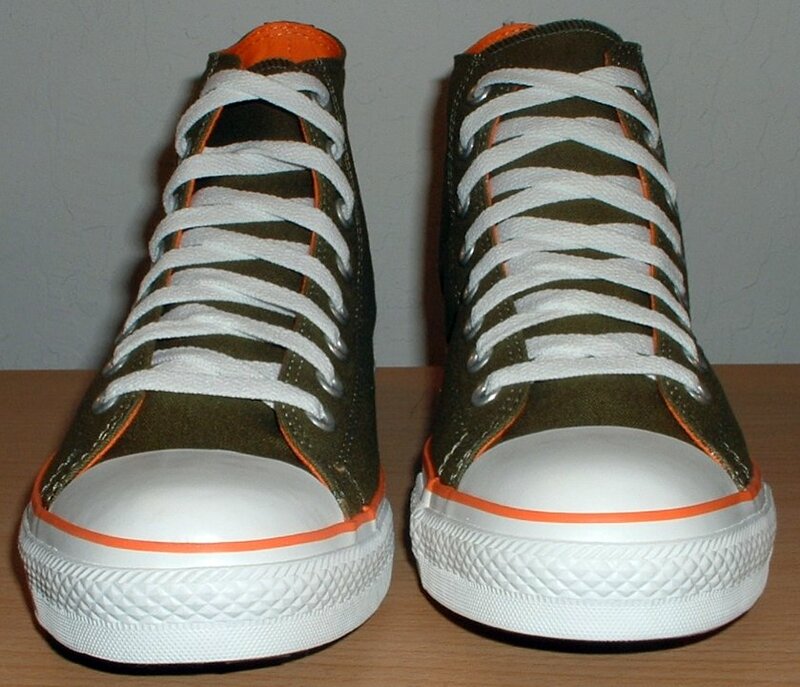 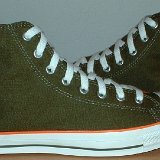 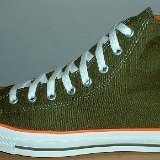 48 Foldover High Top Chucks Outside view of a left olive green and orange foldover. 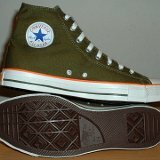 49 Foldover High Top Chucks Inside patch view of a left olive green and orange foldover. 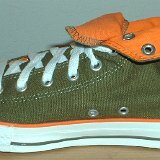 50 Foldover High Top Chucks Inside patch view of a right olive green and orange foldover. 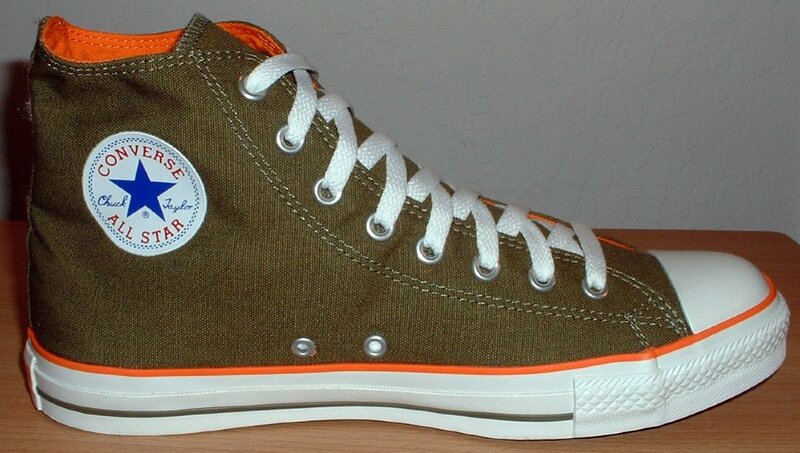 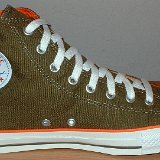 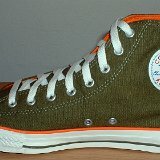 51 Foldover High Top Chucks Outside view of a right olive green and orange foldover. 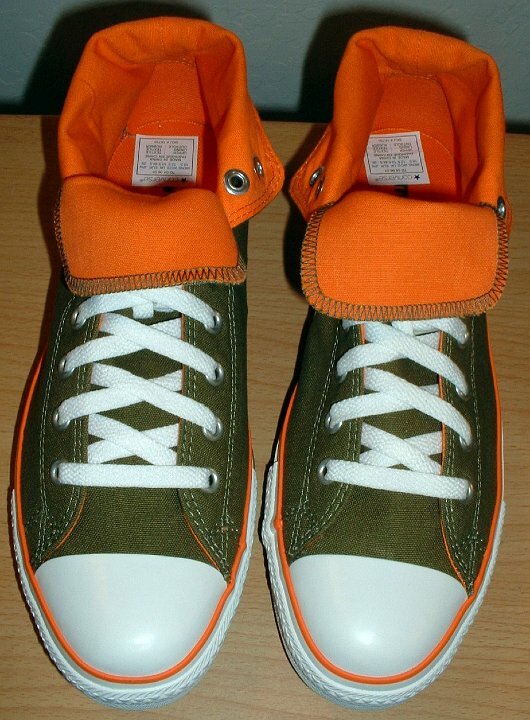 52 Foldover High Top Chucks Front view of olive green and orange foldovers. 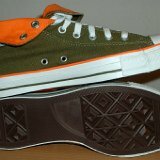 53 Foldover High Top Chucks Angled front view of olive green and orange foldovers. 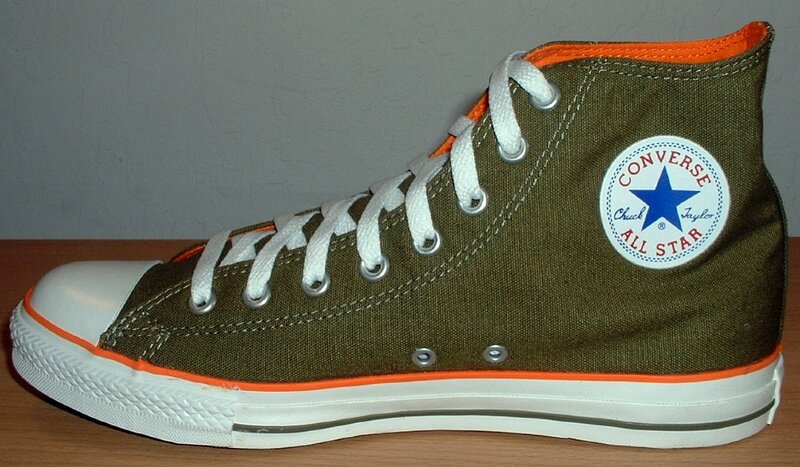 54 Foldover High Top Chucks Rear view of olive green and orange foldovers. 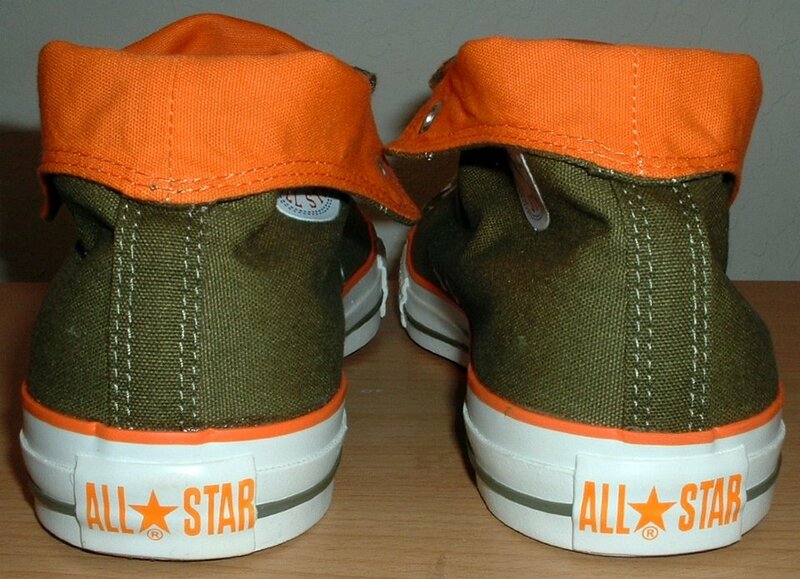 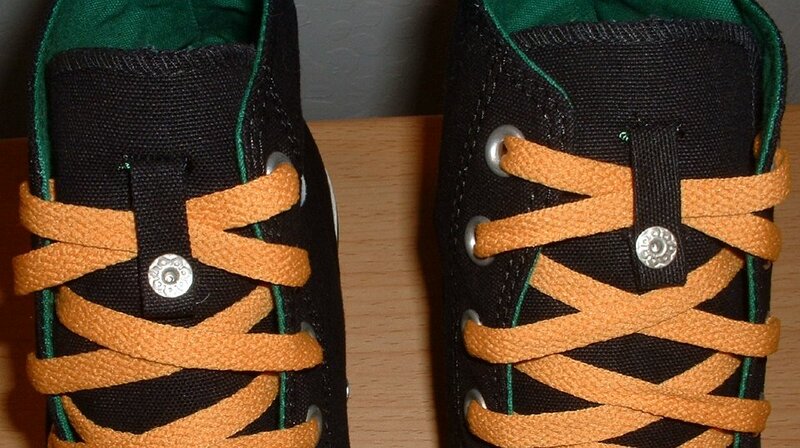 55 Foldover High Top Chucks Top view of olive green and orange foldovers. 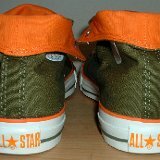 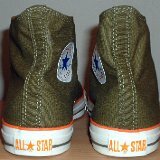 56 Foldover High Top Chucks Inside patch views of olive green and orange foldovers. 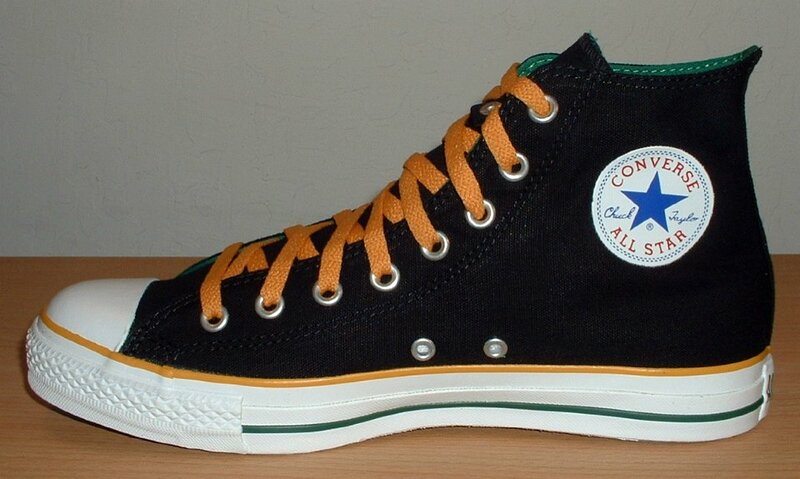 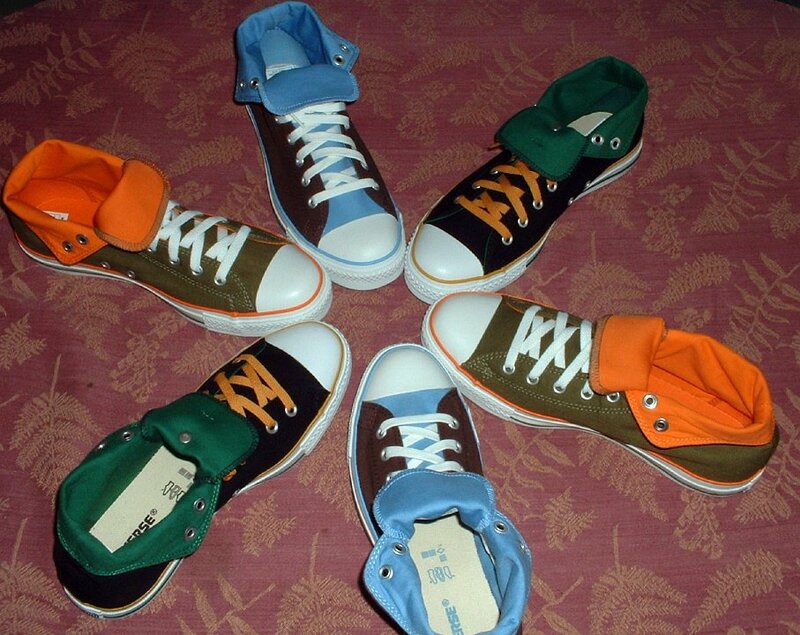 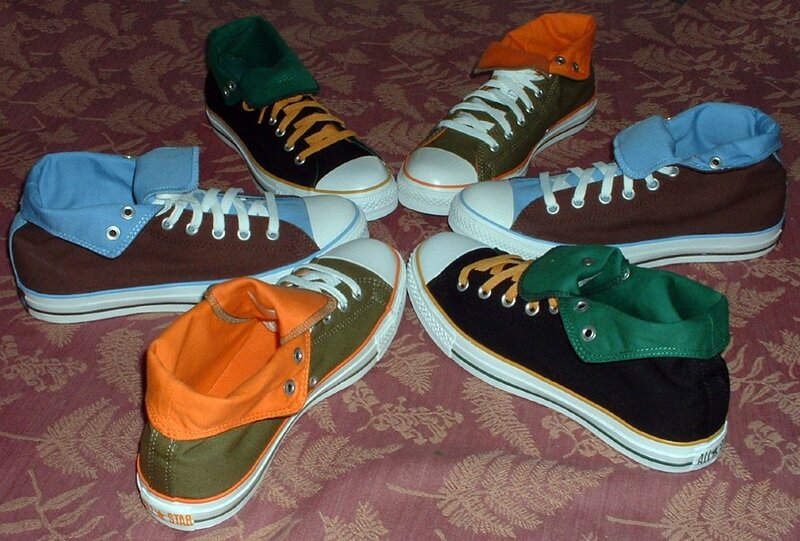 57 Foldover High Top Chucks Outside views of olive green and orange foldovers. 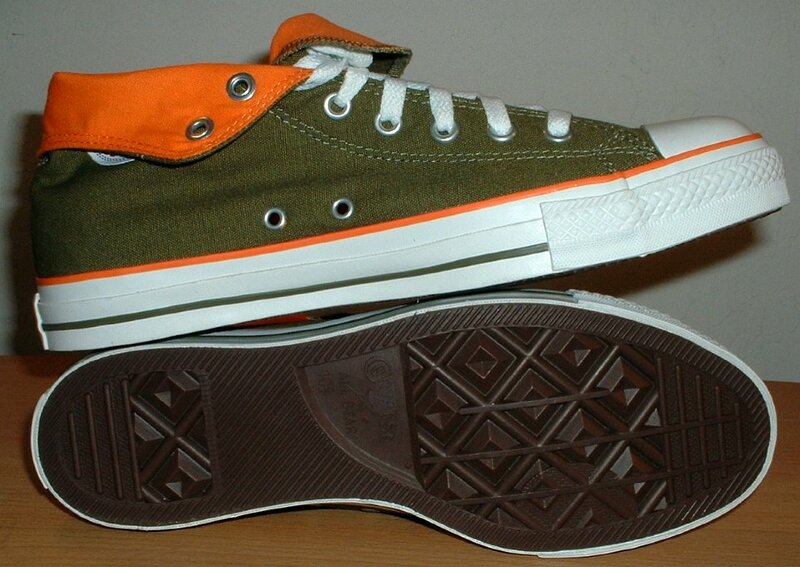 58 Foldover High Top Chucks Sole and inside patch views of olive green and orange foldovers. 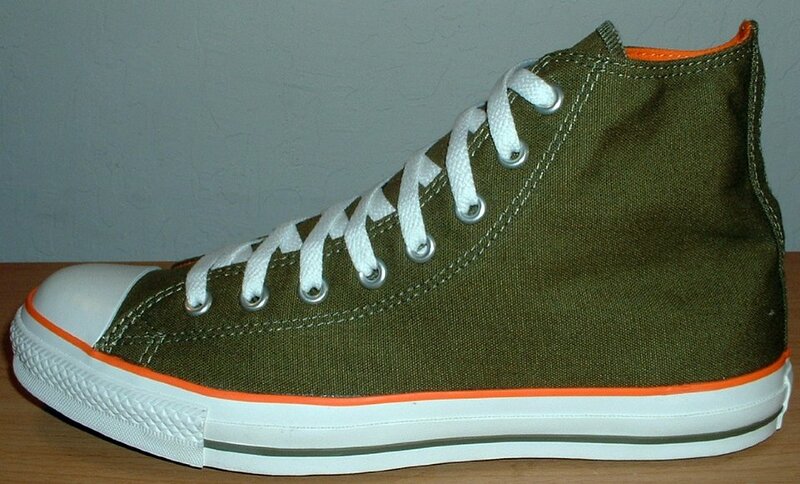 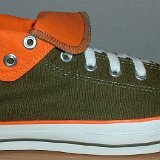 59 Foldover High Top Chucks Outside view of a right olive green and orange foldover rolled down to the sixth eyelet. 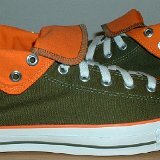 60 Foldover High Top Chucks Inside patch view of a right olive green and orange foldover rolled down to the sixth eyelet. 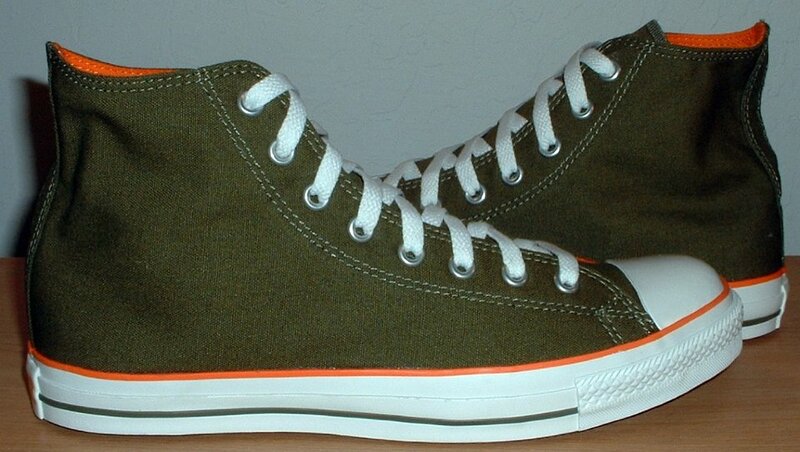 61 Foldover High Top Chucks Outside view of a left olive green and orange foldover rolled down to the sixth eyelet. 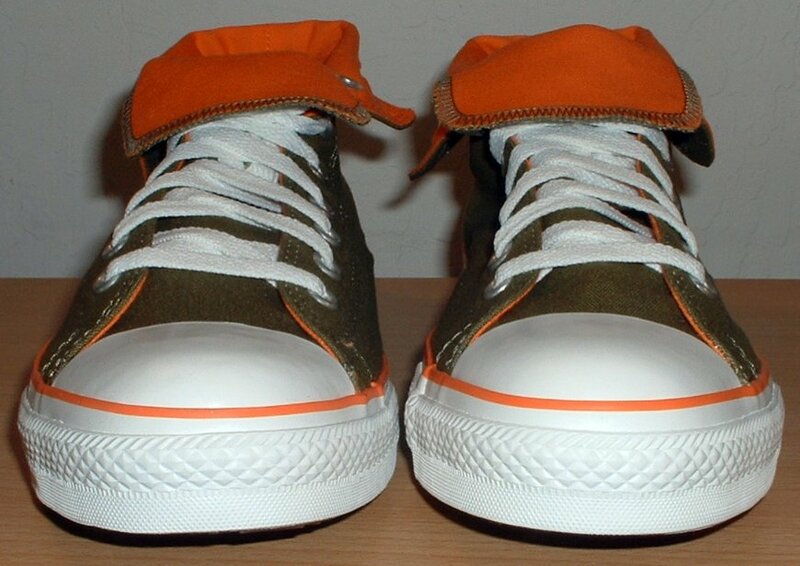 62 Foldover High Top Chucks Inside view of a left olive green and orange foldover rolled down to the sixth eyelet. 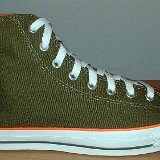 63 Foldover High Top Chucks Front view of olive green and orange foldovers rolled down to the sixth eyelet. 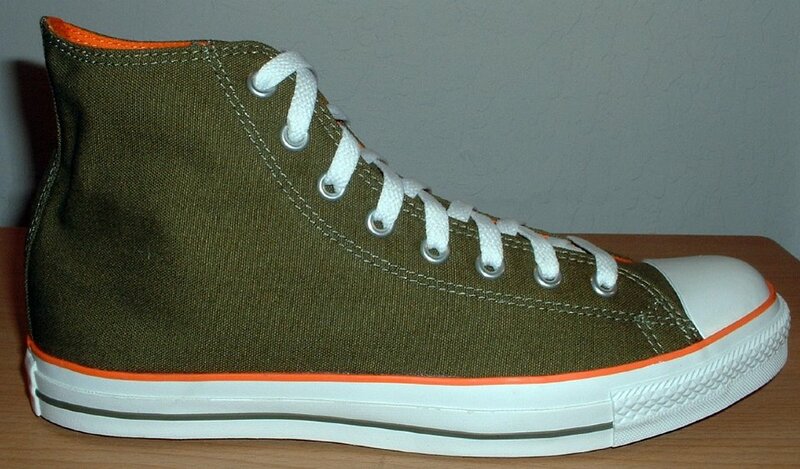 64 Foldover High Top Chucks Angled front view of olive green and orange foldovers rolled down to the sixth eyelet. 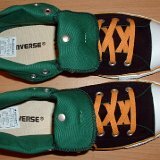 65 Foldover High Top Chucks Rear view of olive green and orange foldovers rolled down to the sixth eyelet. 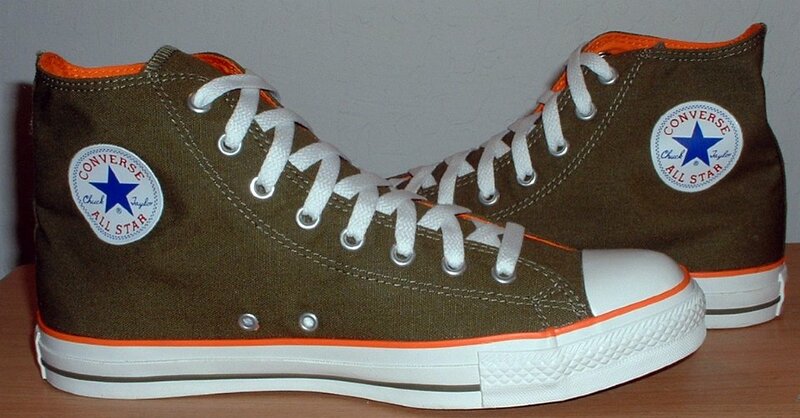 66 Foldover High Top Chucks Top view of olive green and orange foldovers rolled down to the sixth eyelet. 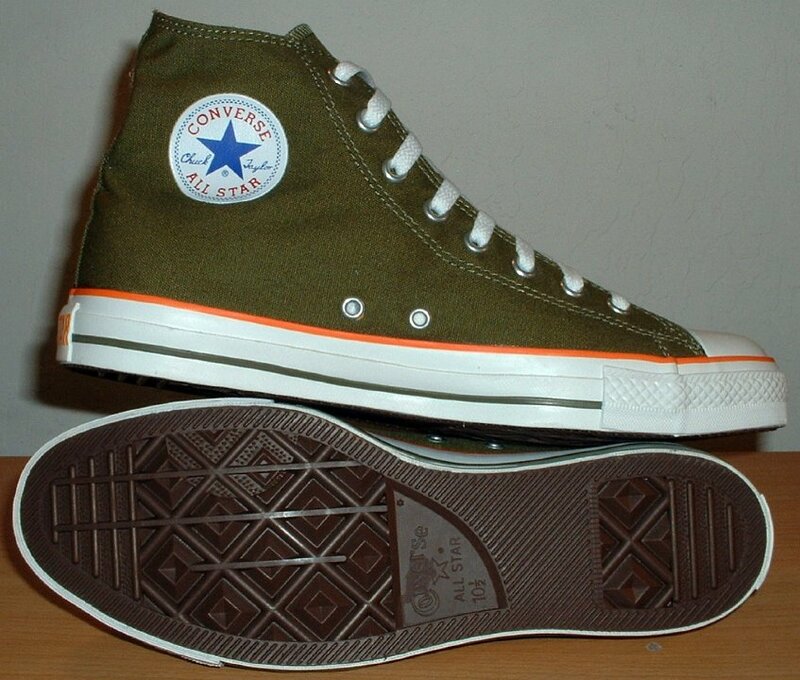 67 Foldover High Top Chucks Inside patch views of olive green and orange foldovers rolled down to the sixth eyelet. 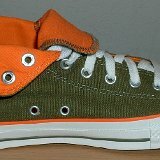 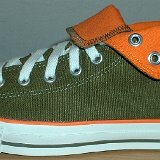 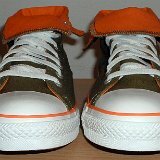 68 Foldover High Top Chucks Outside views of olive green and orange foldovers rolled down to the sixth eyelet. 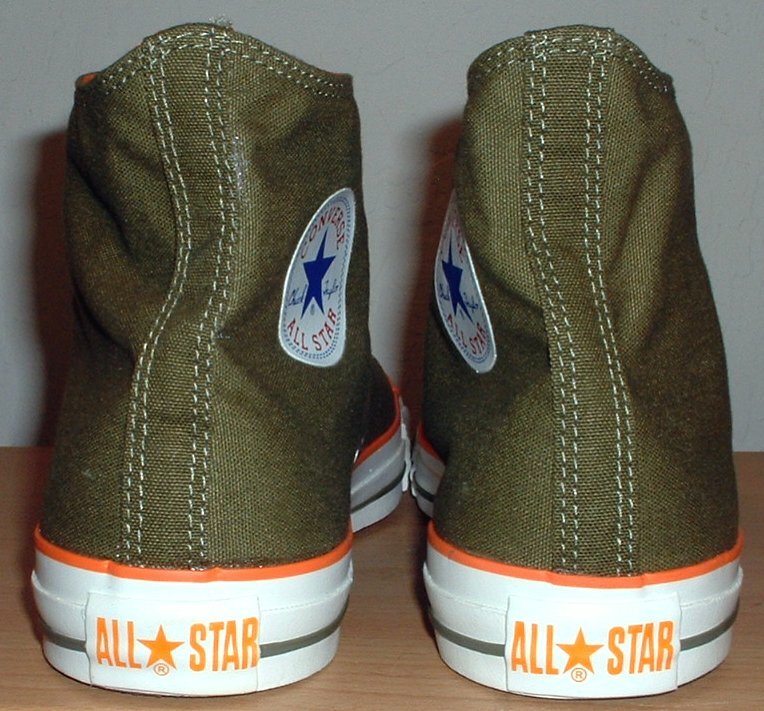 69 Foldover High Top Chucks Inside patch and sole views of olive green and orange foldovers rolled down to the sixth eyelet. 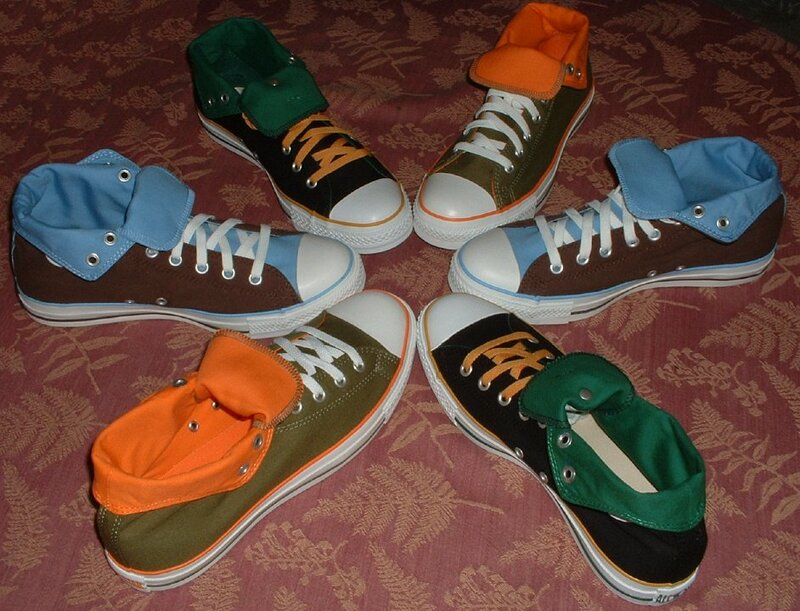 70 Foldover High Top Chucks Wheel of foldover chucks, view 4. 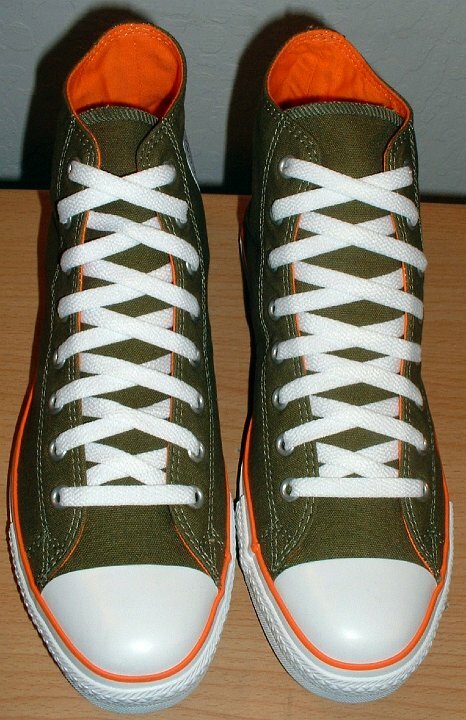 Foldovers are high top chucks with an inside and outside canvas color or pattern that can be worn two ways, as a regular laced up high top, or with the top part of the canvas rolled over. 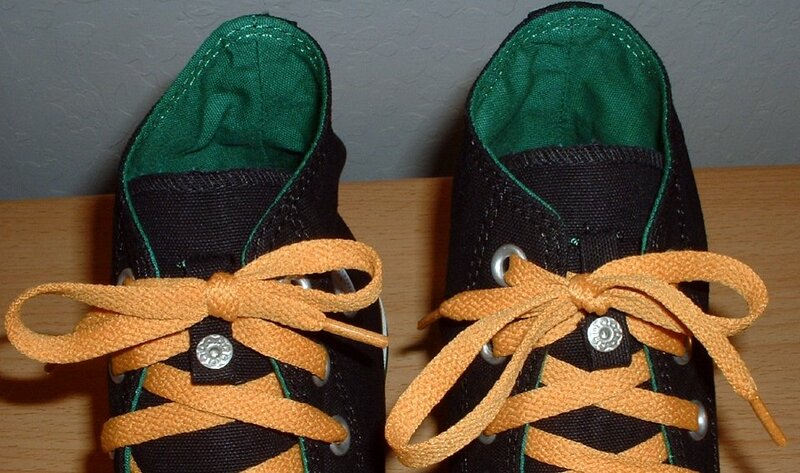 These shoes have color heel patches that match the color scheme, outer piping that matches the inner color, and outer stitching the matches the inner color. 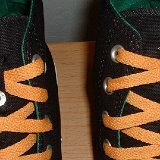 The shoes don't have a complete heel support piece in the back, which makes it easier to fold over the canvas. 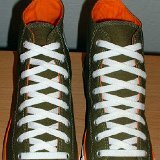 Photos in this gallery show three different models of foldovers laced up all the way, and rolled down to the sixth eyelet.